Distracted driving is the leading cause of car crashes, as TeenSafe reports that 80% of all vehicle collisions are attributed to a driver being distracted or not paying attention. While most people may immediately turn to cellphones as the only cause of distracted driving, eating, talking, adjusting climate or audio, applying makeup, and more scenarios all contribute to the rising rates of distracted driving crashes. In honor of Distracted Driving Awareness Month, TeenSafe and the National Safety Council have released social media kits and statistics that reveal the truth of distracted driving. For instance, it may seem like a safe alternative to use hands-free devices, but NSC has dispelled that myth, citing “the activity in the area of the brain that processes moving images decreased by up to 1/3 when listening to talking on a phone.” It’s imperative to not only keep your eyes on the road, but to also keep your mind on driving, as even hands-free devices contribute to distracted driving. Although the consensus may be that teens are the greatest offenders of texting while driving, TeenSafe reports that 77 percent of adults and 55 percent of teens believe that they can easily manage texting while driving, and over 80 percent of drivers admit to “blatantly hazardous” behavior while driving. While these statistics should be enough to keep anyone off the road or stop distracted driving, NSC reports that motor vehicle fatalities are up 6 percent from 2015, and more than 40,000 people have died in motor vehicle accidents in 2017. Distracted driving is quickly being universally recognized as an American epidemic. Dashboard controls, passengers, food, makeup, cellphones, and other distractions in the car are taking away drivers’ concentration and resulting in an increase in collisions all over the United States. Education and social media campaigns are quickly becoming the only way to fully educate the public on the dangers of distracted driving. 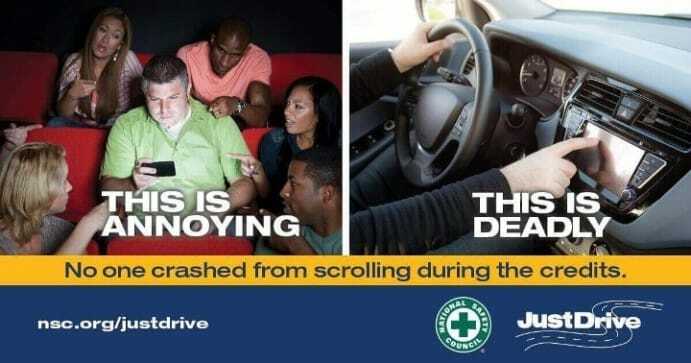 So NSC launched its Just Drive campaign during Distracted Driving Awareness Month, which invites people to educate themselves and pledge to stop driving while distracted. Distracted driving is a completely preventable form of motor vehicle accidents can devastate or end a life. Death and injuries from motor vehicle accidents can stem from driving under the influence or from distracted driving. If you’ve been injured in a distracted driving accident, contact Columbus distracted driver accidents attorney at Heit Law for a free consultation.